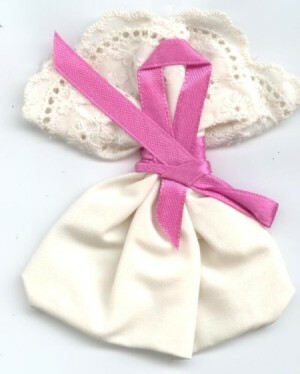 These lavender sachets are made with the minimum of sewing, but still give the impression of traditional craftsmanship. Take an 8 inch length of lace and fold it in half to make a 4 inch square. Seam the two raw edges. Insert a teaspoonful of lavender. Use narrow ribbon to bind the bag below the lace edge, and finish with a bow. It would be possible to fashion a loop from the ribbon to affix to a coat hanger, but you might want to draw up the bag with a running stitch before affixing the ribbon, in this case, to make sure that the bag contents would not end up on the floor if the ribbon was pulled in the process of moving coat hangers along the rail.